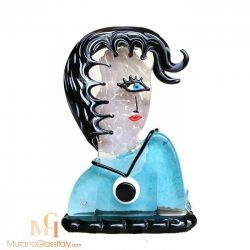 Mario Badioli is one of the most passionate and innovative contemporary glass artists in Murano, Italy. The work of Mario Badioli honors the ancient tradition of Murano glass making. At the same time Mario Badioli gives a modern twist to his creations. Mario Badioli began his career in the early 1950s at a furnace in Murano. The world of ancient Murano glass making, its secrets, charm and creative atmosphere mesmerized the young Badioli. Mastering the art of glass-making became not only his profession, but passion. He gave form to his emotions by working the liquid glass, giving tears, joys, sacrifices and love with every move he made. The Badioli Murano Piacasso collection is a true representation of Mario Badioli ‘s virtue of art. The different pieces of the Vetreria Badioli Murano Piacasso collection are available in limited numbers only to ensure the uniqueness of the collection.